A beautiful and tender picture book about how to say goodbye. A treasured classic from two highly acclaimed picture book makers. Old Pig and Granddaughter have lived together for a long, long time. They share everything, including the chores, until the day when Old Pig does not get up as usual for breakfast. Calmly she pays her bills and puts her affairs in order. 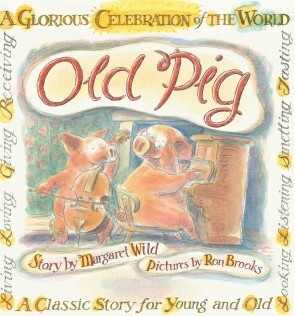 Then she takes Granddaughter on a last, long walk – looking and listening, smelling and tasting.Old Pig and Granddaughter say goodbye to each other in the best way they know.